Given that I saw old Hollywood when I saw this lady for the first time, it can come as no surprise that I went for glamour when it came to redressing her. When it came to a brunette with cherry red lips…there was only one color I wanted to go with…RED. This entry was posted on October 20, 2012 by raberry65. 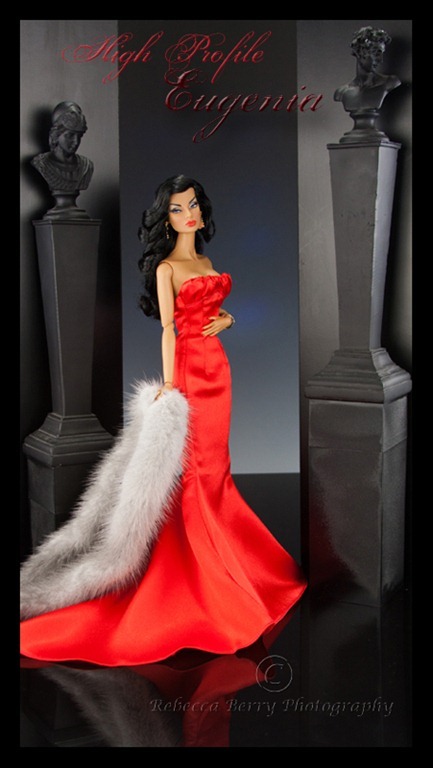 It was filed under Eugenia, Fashion Royalty and was tagged with 2012 Fashion Royalty Convention, 2012 Fashion Royalty Convention centerpiece, Dimitha, Doll Diorama, doll photograhy, Fashion Royalty, High Profile Eugenia, Integrity Toys, T.D. Fashions, Tropicalia. This is the first doll I’ve owned that I actually want gowns for! Great redressing! 🙂 Thank you! Pull out those gowns…I know you must have a few right? I continue to be amazed at the beauty you and Elisa bring out of her in her urban chicness finery. Rebecca, I love the close up of her with the stole – absolutely sublime! Rebecca you never ever disappoint, this photo is a home run. Thank you so much for sharing. Wow – she look so glamorous in this gown!! Love the color choices, especially how the grey fur highlights her gorgeous eyes.